Need a pre-purchase inspection in Maroochydore? We’ll send our industry recognised RBI expert to inspect the property, find any potentially expensive problems, and draw up a comprehensive property condition report. Latest Technology: We use the very latest available thermal and moisture sensing technology. Want to be present when the inspection takes place? No worries! Feel free to watch your Inspector in action. By being in the tick of the action, you can talk to the Inspector directly and ask about issues. We do ask, though, that you save questions until the inspection is finished to ensure a thorough and uncompromised report. We draft condition reports in easy-to-read English to help you make the right decision. To this end, we’ll send one of our RBI inspectors to inspect your property. Once the inspection is complete, your report will be written up rapidly. Our comprehensive reports, including photos of any potential or existing issues that we find, have detailed comments that will be your key to dodging a bad deal that could cost you a packet to fix up. We follow strict Australian Standards (AS 4349.1-2007 and AS 4349.3), meaning that our reports are recognised by the legal and real estate professions. We’ve carried out well over 1000 inspections in Queensland – and as professionals, we always adhere rigidly to the best practice, and have local and experienced inspectors available right now to leap into action for you. We care about your property and here’s how we prepare your condition report. It looks beautiful, doesn’t it? And the estate agent’s advert reads like pure poetry! However, that lovely coat of fresh paint or new wallpaper could be concealing damaged or pest-infested internal structures. Not everything is easy for the layman to spot, so you need an expert eye cast over the house before you commit. Our eagle-eyed, highly-trained inspectors will show you the horrors that lurk beneath the surface as well as those that could come later. For your protection, he’ll search out defects and deliberate attempts by the seller to hide the truth; and will use all the tools at his disposal, from ladders and powerful torches to the latest electronic devices, the work out the extent of all damage. No expense is spared in order to put you in the picture: If any sign of a problem is detected, they’ll use radar and thermal sensing devices to look inside walls and cavities – all at no extra cost to you, unlike some other building inspectors. To inspect for pest infestations, it used to be necessary to drill, tap and even remove parts of walls – but no more. Those old ways were messy and often ineffective, but today we benefit from cutting-edge technology designed to detect pests without any trace of damage to the property. Our toolkit of thermal and moisture sensing equipment plus radar technology allows us to detect problems as though we could see through walls, we never need to disturb the structure in any way. 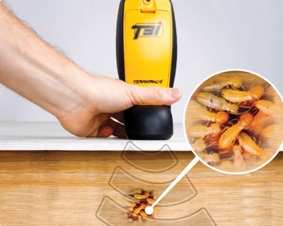 Every RBI inspector is fully-trained to use and always carries the Termatrac T3i device, the only product available which can accurately detect the presence of termites without marking the property in any way. We provide you with an inspection report written in plain English, so you don’t need a degree in architecture to understand it, but also fully-compliant with Australian Standards AS4349.1-2007 and AS4349.3. we will show you areas that you need to be concerned about and safety issues that could cost you dear to put right; and we provide photos that show you exactly what you need to know. Our reports meet Australian Standards AS4349.1-2007 and AS 4349.3, and so are great for your estate and your legal representatives. If we find anything during the inspection which threatens your investment in the property, you can use the report as grounds to terminate a contract or give you a stronger hand in your negotiations with the seller. All of this means that when you decide to buy, you can be confident that you are making the right choice. Nobody beats us in Maroochydore! Get Caloundra Building Inspection Today. Why Choose Rapid Building Inspections in Maroochydore? Training is key to our success, but at the same time nothing beats the experience of our inspectors each is a qualified building professional backed-up by years of industry knowledge. All of this means that RBI inspectors are perfect to sport the issues a normal inspector might miss. As active IBC members, we never stop seeking to improve our capabilities so that we can better serve you with your inspection. Following Australian best practices and standards AS4349, our trained and qualified staff are the best qualified to see your inspection through no matter where you are in Queensland. Our work is backed-up by our $5,000,000 indemnity insurance, we won’t need to use it, but it serves to assure you that our inspections are second to none. Our expert RBI inspectors are armed with the ‘Termatrac T3i’ and ‘Tramex Moisture Encounter Plus’. These devices can precisely detect, locate and confirm the presence of termites without the need to physically penetrate any walls, floors or ceilings; and more importantly, it won’t disrupt or displace termite activity. The Remote Thermal Sensor pin-points significant heat sources that indicate the possible presence of termites within conventional building structures and the Termite Detection Radar accurately detects and confirms the presence of termites in the suspect areas. It can also trace and locate termite nests and entry points. This device uses a calibrated radar signal to identify termites through timber, brick, masonry, concrete, plasterboard, plastic and other common building materials. No drilling holes, no need for tapping or prodding. Better still, the termites aren’t disturbed so they remain active for easy and accurate detection by the Termatrac Termite Detection Radar. The moisture sensor built into the ‘Termatrac T3i’ hand-held unit measures and records different moisture levels in building materials without damaging them. It identifies potential termite risk areas by the concentrated presence of moisture in most surfaces such as wood, plasterboard, roofing, plastic, brick and concrete. All of our inspectors are equipped with the ‘Tramex Moisture Encounter plus (MEP)’. This is a non-invasive overall building inspection moisture meter. It’s fast, precise and versatile! It can measure and evaluate moisture levels through paint, wall coatings, plasterboard, ceramic tiles, floor coverings, wood, roof coverings and ceilings. We know that for you, the report is time sensitive, so once payment is received, we will get it to you within 24 hours o the inspection, or your money back. But just because we’re fast, doesn’t mean we cut corners! Every pre-purchase building and inspection report undergoes a stringent quality review by our head office before it’s sent to you. Our commitment to you is that you’ll receive a top-quality, 100% unbiased pre-purchase building and pest report at the best price in Maroochydore. How can we do this? Easy as pie. Our inspectors concentrate entirely on inspecting and reporting, they don’ need to worry about discussing, negotiating and booking access to the property with the estate agent or seller. We ask you to help out by helping us to arrange the access with the other parties so that our inspector can just arrive, work his magic for you, complete your report and then be on his way to his next client. If anything changes, we ask you to let us know 24 hours in advance so we can reschedule accordingly. What does rapid mean? It means a guarantee that we’ll arrive on time, inspect the property and dispatch your report fast. If we don’t get the report to you within 24 hours, you get your money back. When can you do the inspection? We hate to turn away work, so we always do whatever it takes to ensure that a slot is available for you. Could I attend the inspection? Want to be on-site to see the inspection happening? No worries! We ask that you let the inspector complete the inspection uninterrupted so that we can be sure that your report is thorough and uncompromised, but after that you are free to ask questions to the inspector – he will be happy to help you with anything you need to know. Do you check the loft and roof? Provided we are able to access it, just another way we provide the best value in Maroochydore. What is included in the report? 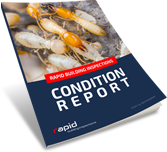 The report includes the results of your building inspection, pest inspection, or both – all in easy-to-understand English. How soon will I receive my report? As long as you have made payment, we guarantee to put the report in your hands within 24 hours of the inspection – or your money back! Can I rescind my contract based on your findings? Our condition reports meet current Australian Standards and are therefore recognised and accepted by real estate agents and solicitors. Provided you have special conditions in your contract, RBI’s condition report is known as proof. What happens after I book an appointment? Our concierge team will speak with you to confirm all of the necessary details, and we’ll send the inspector at the agreed time. Simple as that!